Lauren won the Premier League twice and the FA Cup three times in six years at the clubLaureano Bisan Etame-Mayer (or Lauren, as we know him in England) would go on to be a regular member of one of the great teams of the modern era.But before playing his part in Arsenal's Invincibles season of 2003-04, the defender had led a life far removed from many Premier League players.His family fled political persecution, food was at a premium and he had to ask a kit man for his big break. Fifteen years on from one of football's great achievements, when Arsenal became the first team in the modern era to go through an English top-flight season unbeaten, the former Cameroon full-back sat down with me to discuss all those things and more. In November 1988, an 11-year-old Lauren and a friend took themselves to Sevilla's training grounds, where the Spain and Republic of Ireland sides were preparing for a World Cup qualifier.He approached the Sevilla kit man and told him that he would like to train and play with the club.It was a bold move but one rooted in the fact he had been playing at Montequinto as a striker and had scored 56 goals. Sevilla made inquiries and his career was launched. "First of all I loved football and I wanted to be a footballer," Lauren says. "We would play football all day until 10pm at night in the summer. Football was the main focus and of course the other fact was that it helped my family. "It was to help my mum especially. She went to Madrid to work and I thought, 'I have to do something to help this woman'. "She came from a wealthy privileged position and now she was working cleaning houses, or the stations and the toilets, and mentally when you've come to here and you've been there, it's not easy. "My father didn't want me to play football - he said I had to go to the university. But my mum said, 'If you believe you want to be a footballer, give 120%. If you want to do it, do it for real, otherwise you won't do it. '"The lack of infrastructure and transport facilities in Seville at that time meant he faced a long walk to and from training after school. His desire to succeed led him to become an obsessive trainer, so much so that he brought himself to the edge of collapse. "Yes, it was a bit tough," he remembers with typical understatement. That work ethic brought Lauren spells with Levante and Real Mallorca after leaving Sevilla, but it was at Arsenal where his career really took off.The move might never have happened. He was supposed to leave Mallorca for Roma, but that deal fell through after chief executive Mateu Alemany refused to release him. The following year, the call came from Arsenal.He spoke with manager Arsene Wenger at vice-chairman David Dein's house in a meeting he describes as "something special". 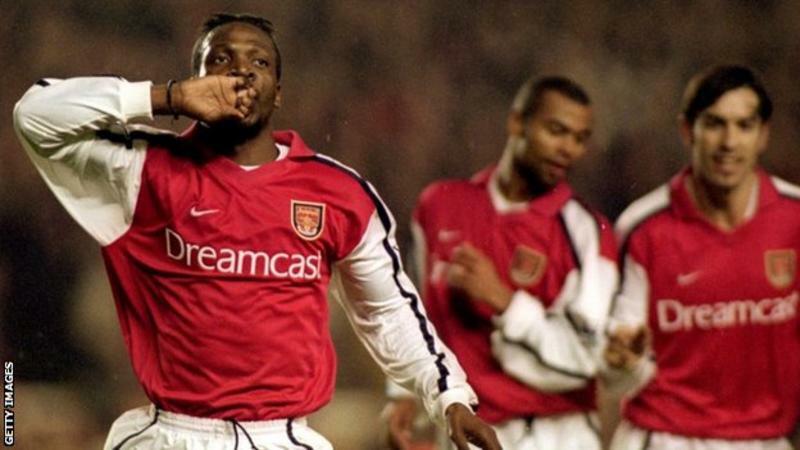 "You could feel that they wanted to know you, not just the footballer but also the person," Lauren says.Injury hampered his first season at the club but by the time Arsenal had won the Premier League and FA Cup double in 2001-02, Lauren was an integral part of their defence. Score: 0 / 2203:00 You scored 0/22Share your score with your friends! Lauren says he "feels Spanish" - "I have got everything from Seville: the culture, the language, my friends, everything" - but despite that sense of belonging, he opted to play for Cameroon, the country of his birth. It was a decision shaped by a conversation with the Indomitable Lions' legendary goalkeeper Thomas N'Kono, when the pair were team-mates at Levante.Lauren says the decision changed him radically. "I was shocked [by what I heard about the situation in Cameroon]," he says. "You can see so many things on TV but when you see the realities of the situation you realise how lucky you are. "Yes, I had to walk to the training ground. Yes, we had 15 people in our house. But I had a home, I had hot water and even if it was just a small piece of tortilla or rice or some lentils, at least we had something to eat. "But when you go away from the main cities in Cameroon you see the reality - kids who have no shoes, no water, hardly anything, and you start to realise. "While on international duty, he shared a room with a young Samuel Eto'o, the only other member of the Cameroon side who spoke Spanish. "Sometimes when I was in the hotel, Eto'o would say to me, 'Why don't you go downstairs?' It was because I was crying, literally, and I didn't want people to see me. "If you thought we had problems or troubles in Europe, you just had to look at that - it was something unbelievable. "For all the tears, though, there were major highs too. His international career included winning gold at the 2000 Sydney Olympics, as well as lifting the Africa Cup of Nations title in 2000 and 2002.As with the trophies at Arsenal, they were proof that a relentless work ethic can overcome the toughest of circumstances.